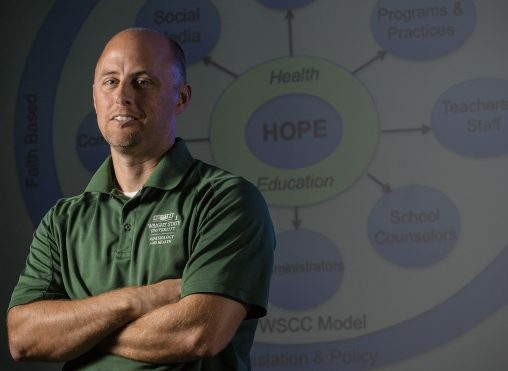 Kevin Lorson, professor and director of Wright State University’s Physical Education Licensure Program, has been honored with the 2018 Outstanding Contributions to Health Education Award by the Ohio Society for Public Health Education. The award recognizes organizational and community leaders in any field for their efforts to initiate or support changes to health education programs that lead to system, policy or environmental change that promote healthy lifestyles. The society said Lorson was instrumental in getting a health education standards bill introduced and referred to committee in the Ohio Senate in April. He also organized an advocacy day for the bill. Also in April, Lorson received an Ohio Chancellor’s Award for helping create a statewide opioid prevention curriculum for Ohio schoolchildren. In 2016, Lorson received a grant from the Ohio Department of Higher Education to organize a statewide team of school health educators, school administrators and higher education faculty to develop the Health and Opioid Prevention Education (HOPE) curriculum. In 2017-18, Lorson served Ohio by engaging as an active partner in the development of “Each Child, Our Future,” Ohio’s Strategic Plan for Education: 2019-2024. Launched by Ohio’s superintendent of public institution and the State Board of Education in the summer of 2017, more than 150 Ohio-based partners participated in the development of the plan. Currently, Lorson is working with the Health Policy Institute of Ohio on efforts to develop a model school health education curriculum for Ohio, aiming to change the landscape of school health education in Ohio for years to come. The Ohio Society for Public Health Education (SOPHE) is a professional membership organization that provides professional development, leadership and advocacy for public health education and those who work in this field. Lorson was nominated for the outstanding contributions award by Holly Raffle, an associate professor at Ohio University’s Voinovich School of Leadership and Public Affairs. Lorson will receive the award on Dec. 14 during the Ohio SOPHE quarterly meeting in Dublin at the Ohio University Dublin Integrated Education Center. On Nov. 29, Lorson received the Meritorious Award from the Ohio Association for Health, Physical Education, Recreation and Dance.